The City of Livingston and the LUSD have been working on a partnership to create the first annual Livingston 5K fun run/walk. Join us on Saturday, May 11! Pre-registration is required. 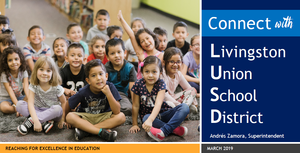 Register at any LUSD office or Livingston City Hall. The school calendar for next school year has been Board approved. Click here to view the entire calendar. Local indicators are based on data collected at the site and district level. Click here to view the entire school calendar. The 10th annual Young Women's Conference is scheduled for March 30, 2019 from 8:00 - 3:30 at Livingston Middle School. Registration for the 2019 Young Women's Conference is now open. Please follow the respective links for presenter, booth and student registration information.